My experience with many diets led me to believe some foods are good for you & some foods are bad for you. The way you lost weight was determined by the foods you cut out of your diet and so on. Chicken + Rice = Good. Ice Cream + Chocolate = Bad. Flexible dieting has been recently gaining momentum as a revolutionary new way of eating. Flexible Dieting (Or commonly known as If It Fits Your Macros) is simply the tracking of macronutrients (protein, carbohydrate and fat) to achieve a body composition goal. Flexible Dieting follows the belief that there are no miracle weight loss foods. No good or bad foods, just macro ratios. 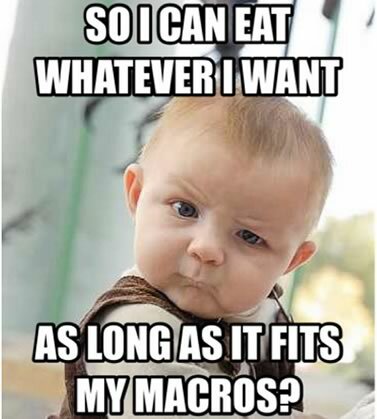 Both are the same macros and so both will achieve the same results in your body composition. When food enters your stomach your body isn’t thinking “Healthy or unhealthy?” it is simply breaking down the food and processing the macronutrients. To maintain and improve overall health, although not necessary to change your body, I’d recommended tracking your fiber intake as well. This will ensure that you are getting enough micronutrients as well. I’ve experimented with a wide range of different diets. All of them have their merits but Flexible Dieting is by far my favorite (And one I continue to follow today). By tracking everything that enters your mouth you stop the guess-work and take control over how & when you reach your goals. Tracking, whether it’s your macros or calories, is hands down the most effective way to change your body. Flexible dieting is just that: Flexible.By focusing on your macronutrient intake rather than eating certain foods you can still achieve your goals while enjoying life with everyone else. You can have your cake and eat it too! Flexible Dieting is the first thing that I’ve been stick to consistently over a long period of time. From my research and experience it seems to kill the “Diet, Binge” cycle many of us have found ourselves on. 1. Calculate your Macros using an online calculator – use iifym.com. Monitor and make any adjustments after 4 weeks. A lot of nutritional information is available on food packaging, however, a scale will ensure you accurately track what you eat. For a more indepth look at IIFYM like our facebook page as we will be putting a link to our new macros E Book on there very soon.